McLaren’s Corporate Social Responsibility program is the way we give back. McLaren staff donate time and money to a worthy cause as determined by staff and management. McLaren matches any staff donations and funds any travel that may be required. 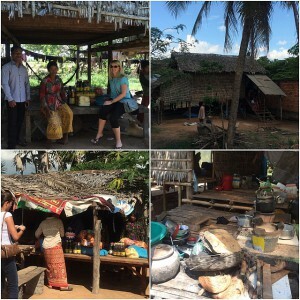 For 2014 four of our staff members will travel to Siem Reap in Cambodia to help out at Sopheak’s Friendship School, teaching English, IT skills and helping with accounting. As well as the money raised, we will also donate an amount of school supplies through the generous support from Complete Office Supplies. We will also spend a morning delivering basic supplies that we have purchased to needy families in a nearby village. Today Cathy and I travelled to a rural area of Siem Reap Province where Sopheak Phantoum runs two schools which he calls Sopheak’s Friendship School. One is known as the Home school, which he runs on the lower floor of his home and the other is called the New school which is a purpose built school. 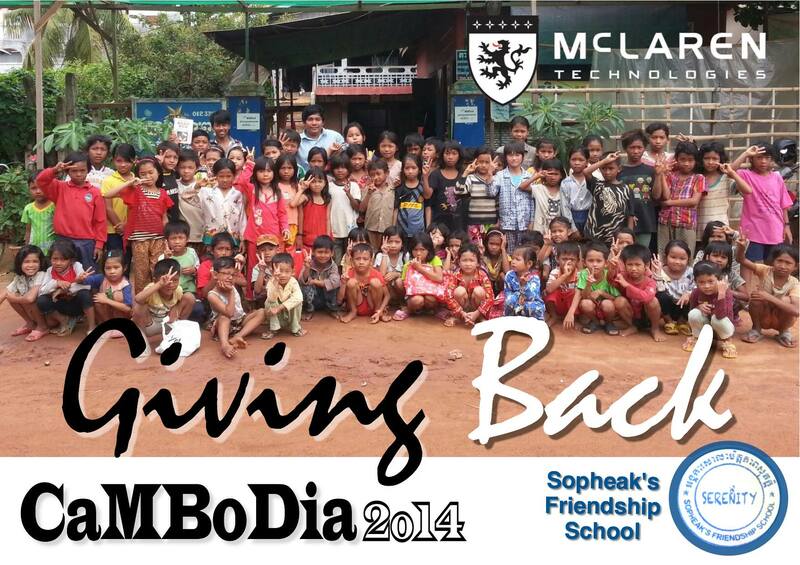 Both are fully supported by Sopheak and the generous donations from the public. We sat down with Sopheak outside the Home school where he explained that the children are not taught English until they get to high school at which time it is too late to teach them to any standard which would enable them to find good employment. He wanted to create opportunities for the local children to learn English at an early age so they would be well prepared to find a job in one of the cities, perhaps in one of the many hotels across the country. We stayed for around an hour just getting a feel for how the classes are run and what the level of English is that the children have. The children look to be aged from around 5 to 15 years and their English levels vary. One gorgeous girl of around five years old asked me my name and where I was from and what my job was. 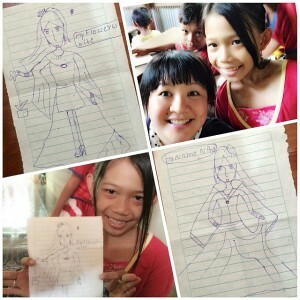 She was able to very clearly tell me her name and that she was from Cambodia and her job was a student. So cute! I spent ten minutes teaching one of the classes which involved no more than me pointing to words already written on the white board while the children recited them. What I was able to do was to assist with the pronunciation which the teachers themselves are sometimes unsure of. We went from here about a half hour car ride to Sopheak’s village where he has set up the New school which he is clearly very proud of and rightly so. The buildings are lovely and new, freshly painted with clean tile floors and proper desks and chairs for all the children. The teachers have an office as do the admin staff which he employs. There is a surprisingly well stocked library and the newly built computer room, which has laptops on each desk except for a few which I think we can fill for him with those we have brought across with us. We stayed here for a couple of hours observing the teacher who at only 17 years old is not much more than a child herself. Today the children studied the letters L, M, N, O and P each writing the letters in their workbooks and taking turns writing on the whiteboard. None are scared to put up their hands to offer answers or take turns at the front. There is constant chatter and it is not discouraged. I went around looking at some of the bookwork which was of widely varying standards but on the whole I was very surprised at how neatly some of the children were writing. Cathy spent some time in the administration office checking on how their systems were running. Cathy has previously spent time at the school and assisted them to set up their accounting system. 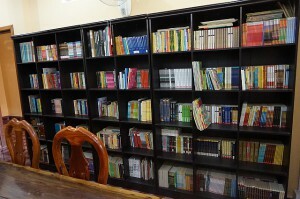 Sopheak showed us his new library which is largely stocked with new books recently sent over from donors in Singapore. We sat and made our plans for the week which will include visiting a village and delivering supply packages to six needy families, and holding a class for the older students and adults (yes he has adult classes too). Many of them aspire to find employment in a hotel so we’ll be doing some role plays and teaching them the words and phrases that they may come across in various jobs in a hotel. We finished off with a tour of the computer room (opening soon) and watched some of the boys play volleyball before the heavens opened up and we headed back to Siem Reap to meet up with Ivan and Karen who had arrived in the afternoon. The only casualty of the day were my sunglasses but I guess that is why airport duty free shopping was invented! Another day of teaching today at the New School after we picked up Sopheak and his dad at the Home School. It was the first day for Ivan and myself. Ivan assisted in setting up the laptops that we brought with us from our office. They were set up accordingly for the students and Ivan made sure they are usable in the computer class. He then spent a good 3 hours fixing up and loading Windows XP and giving some good tips to the school computer expert. Meanwhile Michelle and I were out in the classrooms joining the teachers to teach the class. I asked my class what they wanted to be when they grew up and went over some words used in those jobs. Nurse was a very popular choice for a job! Michelle was next door teaching the English alphabet and displaying some excellent drawing skills! All the kids were participating enthusiastically when questions were asked in the class. There were rewards for any kids who answered the questions correctly. We gave out some of the pens that were supplied by COS, our stationery supplier in Australia, and some candies that I brought with me from Singapore. There were a total of 3 classes and as you can see from the photos, we are glad to have the kids smiling all the time! There was a break before the 4pm class start and the kids were playing soccer on the field, badminton, skipping and some kind of jumping game that looked painful! Some left for the day to continue with their activities and some new students arrived for the next class. Michelle and Cathy took on the 4pm class while Ivan and I had a look around the various buildings and spent time talking to the teachers and some of the children who were still around the school. We look forward to another fun day of teaching tonight when we will take the adult classes and do our best to teach them about working in a hotel and teach some words and phrases they may come across. It was just awesome to see how excited the kids are when they see foreigners joining the teaching. 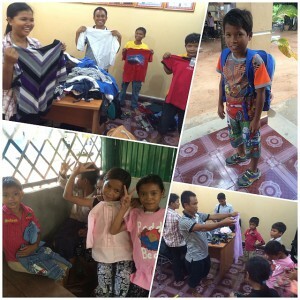 We donated some basic supplies to six needy families in Angkhrong village today, close to the Home School. Sopheak’s mother-in-law helped us with the purchases as well as chose the needy families in her list to receive our donation. She keeps a list of needy families and works on a roster system when she has supplies to deliver. These homes are not accessible by vehicle so we relied on Ivan, Sopheak and the teachers to carry the rice sacks and the ladies and mother-in-law carried the lighter items. Thank you to Sopheak, his mother-in-law and teachers for helping us with the delivery under the hot sun. Sopheak and the teacher distributing some of the old clothes, shoes and bags that we brought with us from Singapore. From the village of Angkhorong and after a short break at the Home School we travelled to the New School. 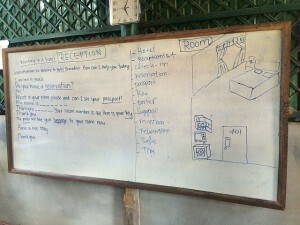 As well as assisting the teachers to teach the children classes just like the previous two days, we had planned a special ‘Hotel’ lesson for two teenagers classes from 5 to 7 pm. The job opportunities in the hospitality industries are abundant in Siem Reap and McLaren is well versed with the hotel industry. What a good match! Having discussed and had rehearsals yesterday while we had our meals, we transformed the classroom to a hotel reception and hotel room! Firstly, Karen gave the students an overview, followed by going through some key words of the hotel industry like check-in, reception and luggage. We had role-play where Ivan acted as a guest checking in the hotel with the help of Michelle as the receptionist and me as the porter. We were very impressed that the students were so enthusiastic participating in the role-playing. It was so well received that we changed our plan for tomorrow and will come up new lessons on ‘Airport’ and ‘Restaurant’ for tomorrow. We hope our little effort here will boost their confidence and help them land on the career of their choice. 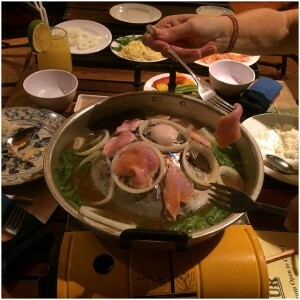 After a hectic day, we had our dinner at Pub Street where we tried the local specialty – barbeque hotpot. Again, we fully made use of the in between times to discuss our new lessons on ‘Airport’ and ‘Restaurant’ for tomorrow. On our final day with the school Cathy and I went with Sopheak, two of the teachers and the maintenance/groundsman to visit one of the floating villages on the Tonle Sap River. 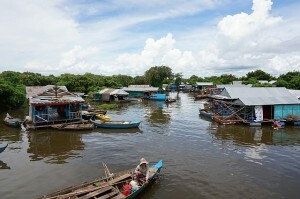 The villages are occupied mostly by Vietnamese people who have entered the country illegally. Travel between the stilted hours is by canoe during the wet season and during the dry season the river is dry leaving the houses standing up to 10m in the air on their stilts. I had my first coconut juice – as in through a straw straight from the coconut. It was fine but next time I’ll take a soft drink. We had two more classes to teach at the school. Again today we taught the older children aged from around 13 – 19 years old. One girl enjoyed our class so much yesterday that she came for both of the classes today! 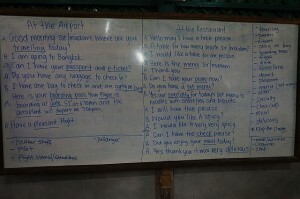 At the request of teacher we had prepared lessons on “In the Airport” and “In the Restaurant”. Right before the first lesson was due to start a storm came in and if you have ever heard rain on a tin roof you will know what I mean when I say the first lesson proved very challenging. We managed to get through it and thankfully the rain stopped in time for the next class. During the classes Karen went over some of the words that they would come across in both situations, taught them correct pronunciation and their meanings. These children have never been to a restaurant or cafe before, come across a menu and certainly have never heard of a boarding pass. Hopefully one day when they find themselves in an airport or restaurant they will think of us and remember some of the things we taught them. When Karen had finished the explanations it was on to role play again, though at times it was not clear if it was en english lesson or a comedy show. We did make the kids laugh a lot and if I had to give an academy award it would go to Ivan for his performance as Hungry Customer at the restaurant. We have really had a fantastic week here in Cambodia and the hospitality from Sopheak, the staff and all the students has been amazing. If anyone would like any information on the school, on how to donate or to volunteer, please contact me at michelle.forrest@mclarenint.com or Cathy How at cathy.how@mclarenint.com. There are a handful of students who need sponsoring to attend high school – the cost is $250 per year. If you can help out, send us an email and we will give you the information. Thanks for taking the time to read this and I hope you’ve enjoyed reading about our time here as much as we’ve enjoyed living it! PS. If anyone is wondering where Ivan’s diary entry is, I am writing it for him today. I really wanted to try the fish foot spa (but not by myself) and I suspected that Ivan didn’t want to write the diary. 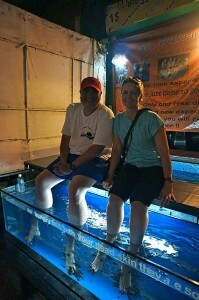 So I offered to write his diary for him if he took a fish foot spa with me. He took about three seconds to say yes but I am not sure if that was an indication of how much he did not want to write the diary or how much he loves fish foot spas!